Despite the core business of Suncity Homes being that of bespoke custom residential homes, we are now finding some of our projects involve commercial aspects. For instance, we have just started a project at Redcliffe, which in the main is a 3 level unit with rooftop pool & entertaining deck above that. However, on the lower level is a commercial tenancy space, that comes with its own unique challenges from a building perspective. There are handicap facilities & emergency fire services requiring consideration, as well as the various challenges faced due to various building classes & codes. The opportunity to demonstrate our skill set, knowledge & experience in the commercial domain is welcome in meeting the needs of our clients. We were building “virgins” when we came across a house and land package with Suncity Homes in Noosa Northrise. When we enquired about the land we realised our mobile number had been written down wrong but Thene went above and beyond and dialed multiple numbers until he tracked us down. Our journey then started, Diane and Thene gave us so much time in the design and concept stage that when we signed to build we had everything covered. We were then ushered into the hands of building manager Ben, who looked after us so well. Nothing was too much, even when we woke in the night panicking about something, an early morning call to him was greeted with calm and care. The house we have created with them all is our dream home and has exceeded our expectations. 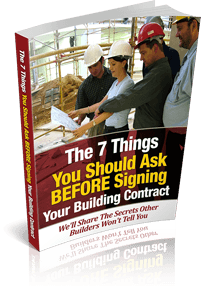 If you're starting on your journey to building a new home I am sure that you will have a few nagging questions, doubts and concerns you may have prior to getting started. Subscribe to receive our Free Guide which may answer many of these questions.